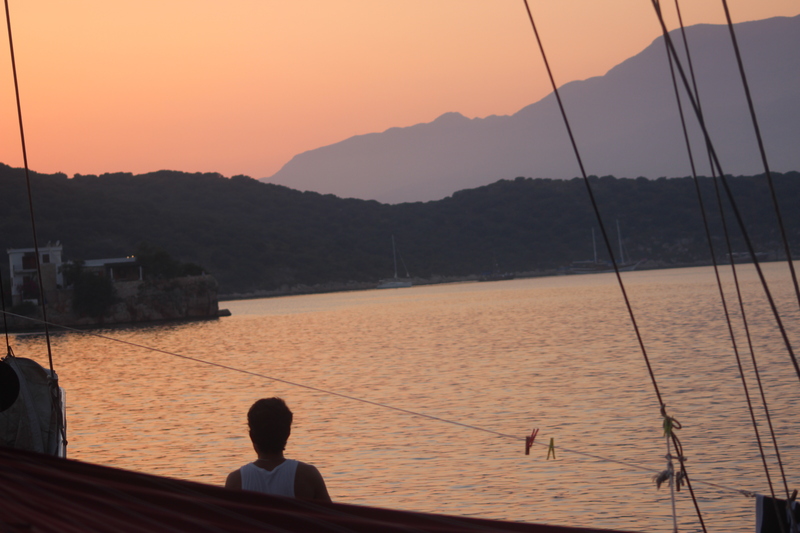 Looking back on our Croatia Sail, I still have more or less nothing but good things to say about it. The young, Aussie crowd and cabin fever aside, it was an unreal few days that I’m sure I won’t forget for a long time. Nonetheless, we were still a little apprehensive when it came to booking this second sail trip. 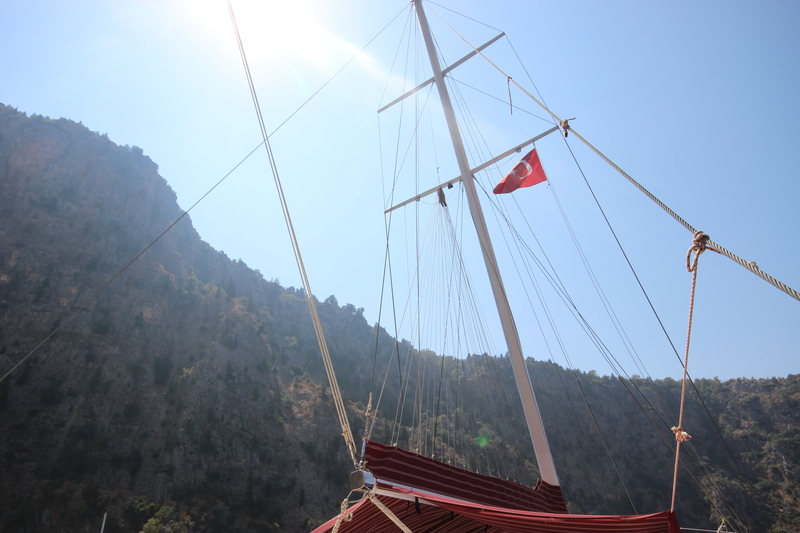 We hadn’t planned on booking this sail, a popular route from Fethiye to Olympos known as the ‘Blue Cruise’, and impulsively booked it only a couple of months ago, as it seemed an easy and scenic way to arrive at Olympos, our next destination. Our apprehension was the same we felt on the eve of our Croatia Sail, that we knew that this would live and die by the group. This time however, we have booked through the company Ala Turka, and have not used an Australian tour company such as Top Deck or Busabout. When we climb aboard the Ali Baba 10 it’s instantly obvious that this was going to be a totally different experience. There was a big variance in age, there was a group of us ranging from 20 – 28, then a few people in their early 30s, and even a really friendly couple in their 50s too. This made us feel happy, and even more so when we got to speaking to everyone. Although the sail was probably still 50% Aussies, there were also Americans, Canadians, Brits and even one German. Ok, so it’s not a huge world variety, but the mix of ages and nationalities meant we were looking forward to the next three days. It’s worth noting that the price you pay also includes your three meals a day, and the food was always great. Lunch was traditional Turkish, lunch would be vegetarian (lots of roasted veggies/salad/rice), and dinner was an absolute spread. It always involved something being BBQ-ed off the side of the boat, which was relaxing to watch. A loud bell would be rung as soon as any meal was ready, and although it was often hard to tear yourself away from swimming, the food was inevitably worth it. Dinner was always BBQ-ed something. Delish. One thing I learnt that is that it doesn’t matter which company you book your Blue Cruise with, across the board no one seems to sleep in their assigned cabins. The cabin is basically just a designated luggage area while everyone sleeps up top on the deck. It was surprisingly comfy, and falling asleep underneath the clear skies was something pretty different and special. The front of the boat, where everyone also slept at night. On only our first day, late in the afternoon, we docked at St. Nicholas Island, somewhere we couldn’t actually believe was named after Santa himself –legend says that this is the place he would holiday after a busy Christmas season. This is not hard to believe, as it was an unbelievably serene place. The trek to the top was hard but worthwhile, especially as you walk past the abandoned ruins from world’s ago. After finally finishing the hike… Much sweat. Lack of breath. Our stop at the small city of Kas was also a highlight, somewhere I would have considered returning back to one-day maybe. We walked through the city centre, populated by mainly ice cream stalls and large restaurants, but also found a small laneway filled with a couple of bars plus a tonne of cute boutiques and small markets selling anything from shoes to jewellery to anything bearing the famous ‘all-seeing-eye’ symbol seen all across Turkey. The ruins of St. Nick’s Island. One thing I was weary of when considering this cruise, was the lack of guide. We were both unsure how this would pan out, especially if none of the crew spoke much English –a real possibility. But thank the cruising gods, we had a wonderful crew of three lovely Turkish guys, complete with a Captain who spoke more than enough English to always explain where we were headed and how long it would take to get there –important information when you get given warning that the engine will be turned on as we set sail at 5am. The days seemed to fly by, even though most of them were spent doing not much. A few times, when we were docked in a small inlet, I saw some loggerhead turtles, which was so amazing. Of course, this always seemed to happen when my camera was nowhere in sight, but I don’t think I’ll need a picture to remember it. These guys were selling home made Gozleme from their BOAT. Our last night went off with a bang, as soon as dinner was cleared away, the lights went off, the disco lights were on as well as the crappy pop music (are LMFAO and Pitbull still relevant to 2015? I was hoping not). Nonetheless, everyone was getting into the spirit of our last evening together –especially the Captain who while we were dancing away was getting much more acquainted with one of the members of our group. I’ll keep her nameless, because she copped enough heat from us to last her a while I think. After downing a few more drinks, a water taxi belonging to ‘Smuggler’s Inn’ came along to pick us up and take us too the famed bar. Safe to say the music was even more terrible here, and the bar seemed to be literally falling apart, but hey, this was almost exactly what I’d been expecting, so it was nice not to be let down! As soon as most of us realised that ‘Mambo Number 5’ was going to be as good as it was going to get, we headed back to Ali Baba 10 and kept the party alive for a while. Skinny-dipping was involved, along with Jay Z and some Beyonce too. 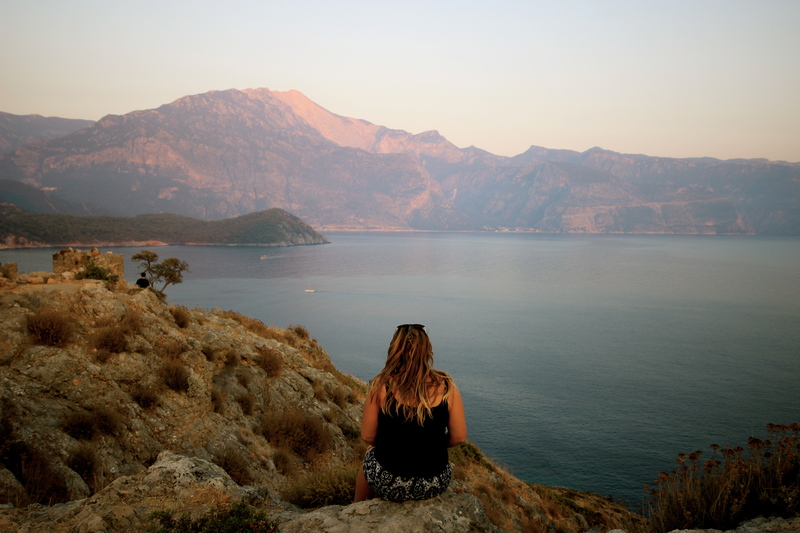 In the end it was a very short three days, just as soon as we’d become a very tight-knit sail family, we were being told to settle our bar tabs and pack our bags, Olympos was in sight. While eight-days of sailing Croatia was possibly one or two too long, this time around we just could have done with one more day to really soak up the last of the rays. But, it was not to be, and at least we got to quit while we were ahead, and go out on a high. 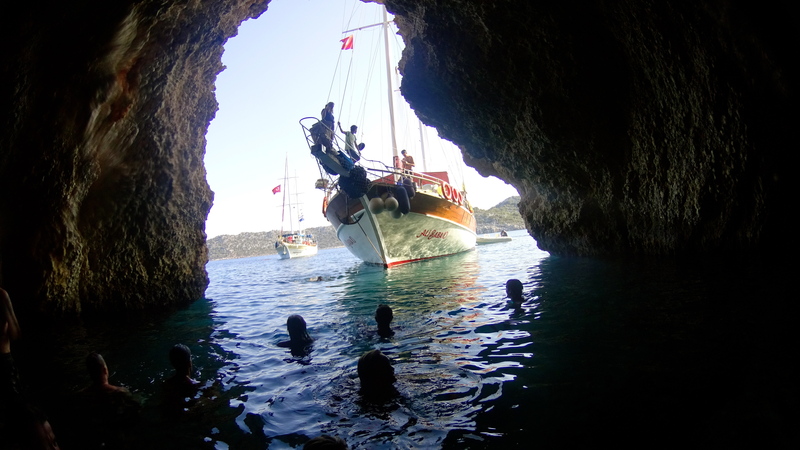 For now, while nearly everyone on the sail will head straight to Antalya, the two of us plus a few other people will stay in Olympos for a while. There isn’t meant to be too much to do here, but I think that’s part of the appeal. 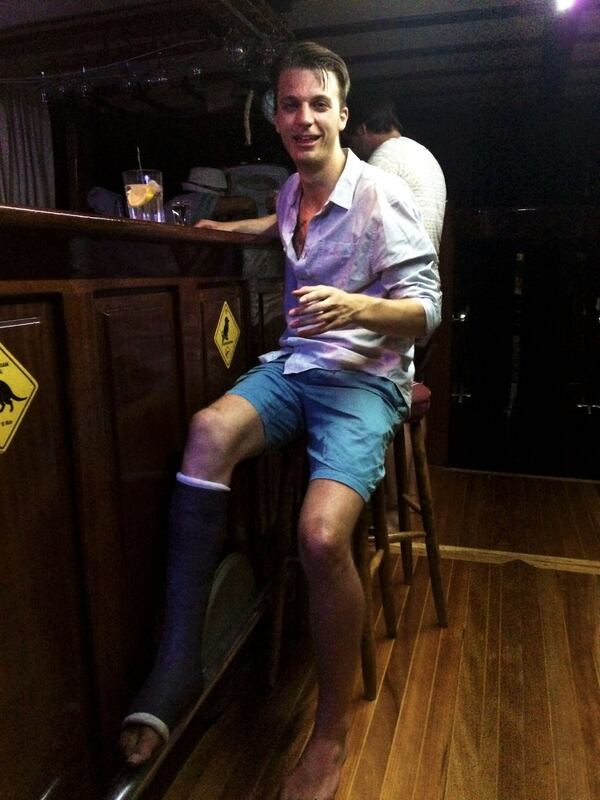 I think I’d like to dedicate this post to Ian, the affable Aussie-living in-London who had broken his foot in a sporting accident before coming on his Turkey summer holiday with his gorgeous girlfriend Amelia. Even with a huge cast, meaning he could seldom get in the water, he was always so cheerful and managed to limp around the boat with more grace than i could manage with both my feet in tact. 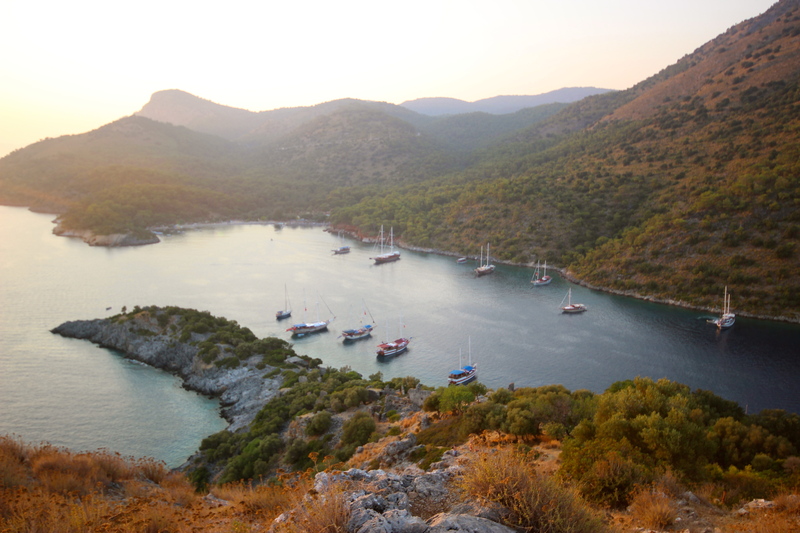 Isn’t Turkey amazing. Had a few people I met do this trip and loved it!